The Toyota RAV4 Hybrid offers a petrol-electric hybrid powertrain, which is cleaner than a diesel, combined with all-wheel drive in a practical SUV body. The original RAV4 was an icon. It was launched in 1994 and it was effectively one of the very first ‘soft roader SUVs’. 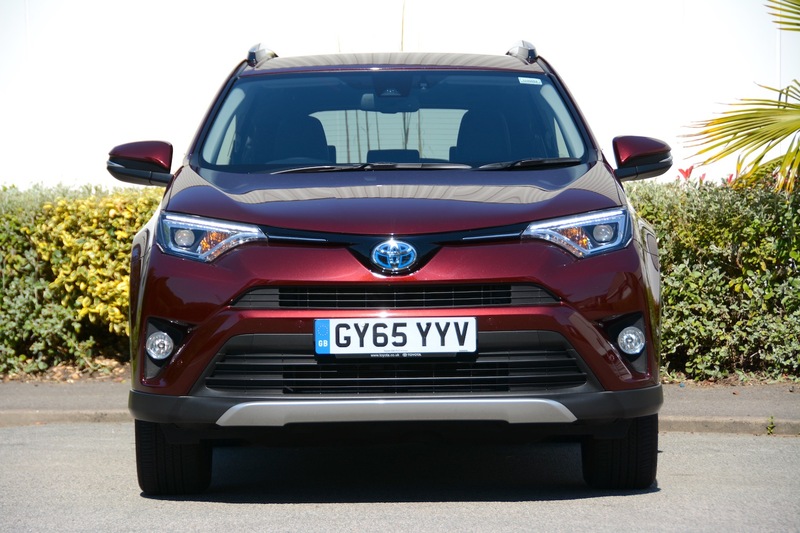 Today, the family SUV sector that the RAV4 sits in is one of the fastest growing segments. So the original RAV4 was a visionary leader, setting future trends. Can the same be said for the latest model, which is now available with a hybrid powertrain? The Toyota RAV4 is available as a Hybrid for the first time. It has a 2.5-litre, 4-cylinder petrol engine, together with an electric motor and battery. The electric motor operates all the time; the petrol engine stops and starts at any vehicle speed. There’s a combined system output of 194bhp. 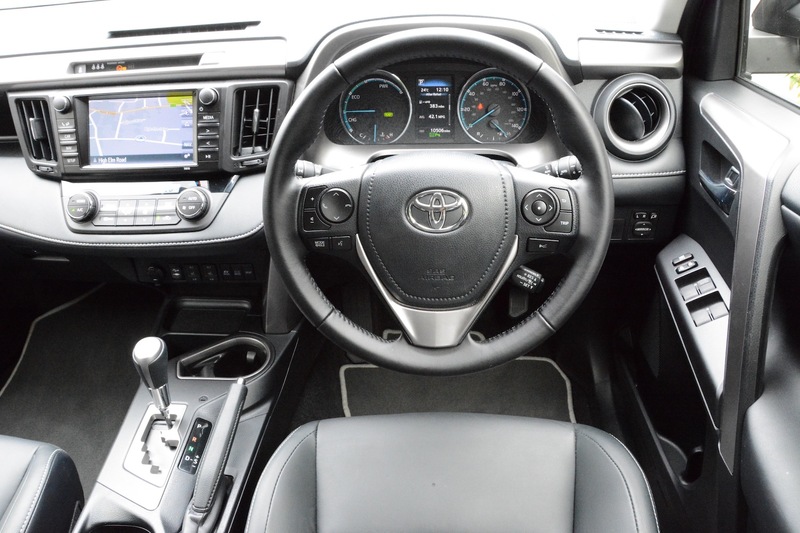 In typical Toyota style, there’s an electric CVT transmission. 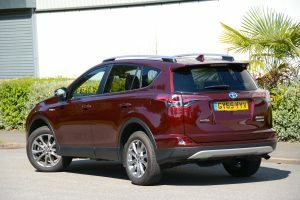 The RAV4 Hybrid is available with front-wheel drive or all-wheel drive. In terms of the exterior styling, we’re not big fans. There are many better-looking rivals. And the interior doesn’t do much for us either: the whole thing feels plasticky and dated, as do details such as the infomedia system. Things don’t get off to a good start in terms of the driving experience, as the one very basic thing to get right – the driving position – isn’t right. The seat doesn’t go low enough, and the steering wheel doesn’t come out far enough. Once driving, if one of the first things you do is accelerate out of a side road into a busy road in the wet, you’ll think this is a front-wheel drive car, as you can experience front-wheel drive-like wheelspin. 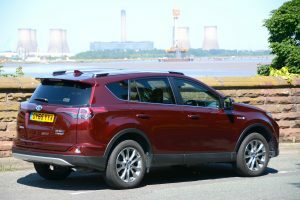 However it turns out that our test car was the all-wheel drive model – even though we couldn’t see any confirmation of this in terms of badges etc anywhere on the car (we’d be amazed if anyone bought a RAV4 Hybrid and took it off-roading, so this didn’t form part of our test). Once you’re underway you’ll notice that the RAV4 is revvy. Yes, this is the characteristic of the Toyota CVT that motoring journalists have complained about for years. 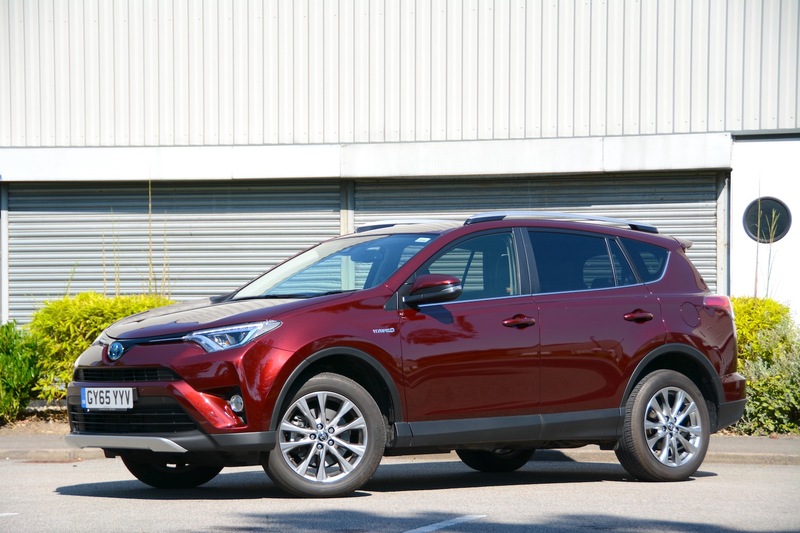 Things seem to have got better with the latest Prius, and the Lexus RX450h, but apparently not in the case of the RAV4 Hybrid. 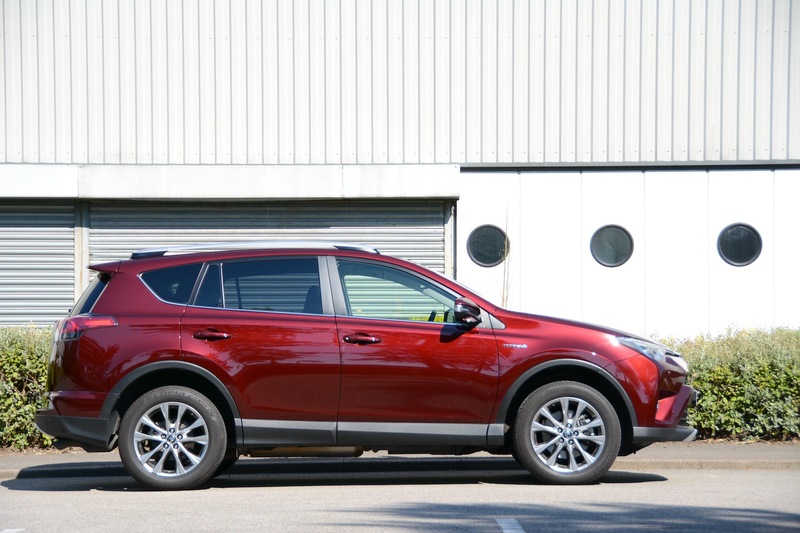 Performance isn’t great, and a reason for this is the weight of the RAV4 Hybrid: 1,785kg. The hybrid system adds over 100kg compared to the petrol model. 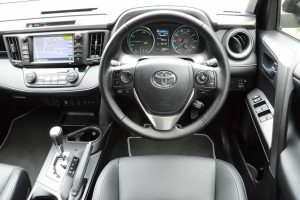 Even the gear selection feels old fashioned – there’s a lot of jiggling around with the gear stick to move it between Park, Drive and Reverse. Of course one bit of good news is that the car is able to operate in electric mode, which helps to avoid emissions that have an adverse impact upon local air quality. So it’s a cleaner choice than a diesel. However you’ll mostly only be able to use electric mode either at a standstill or at very low speeds over very short distances. This is a hybrid, rather than a plug-in hybrid, after all. 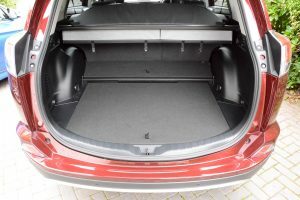 There’s one more good point about the RAV4 – despite the need to package a hybrid battery, the boot is large and the access to it is very low, in fact we don’t think we’ve tested a car in this class with a lower boot floor. Great news if you’ve got an old dog that can no longer jump into cars energetically. The official NEDC combined fuel economy figure for the all-wheel drive RAV4 Hybrid is 55.4mpg, which equates to emissions of 118g/km CO2. This isn’t outstanding for a Toyota Hybrid, but it is good for a relatively heavy petrol SUV. 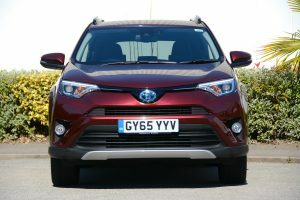 You’d imagine that one of the key reasons for considering buying a RAV4 Hybrid was the fuel economy, so you’d hope that this would be good in real-life driving. Our calculations based on a week’s mixed driving resulted in a real-life economy figure of 33.9mpg. This sounds horribly low, but we’ve checked and rechecked our figures and we’re sure that this is correct. The poor result for the RAV4 may sound surprising, but the Lexus NX300h delivered test economy of 31.1mpg; interestingly, the powertrain and the kerb weight of both cars are almost identical. The Toyota RAV4 Hybrid Excel AWD 2.5L CVT TSS costs £31,990. Our test car had options of metallic paint (£545) and Touch and Go (£750), taking the total price to £33,285. Just something to think about, but the Hyundai Tucson that we tested costed £23,145. This is £10,000 less than the RAV4 Hybrid. And the diesel, front-wheel drive Tucson averaged 43.5mpg. 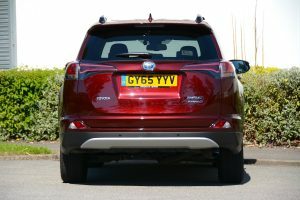 The Toyota RAV4 Hybrid is available with front-wheel drive or four-wheel drive. Earlier this year we tested the latest Toyota Prius and it was highly impressive. It was better to drive than any of the previous generations, it was comfortable, the interior was interesting even if the design may be somewhat subjective, and most importantly it was genuinely economical in real-life driving. Unfortunately the same can’t be said of the RAV4 Hybrid. We’re not fans of the exterior styling, the interior didn’t feel high quality, it wasn’t enjoyable to drive, and the real-life economy was poor. 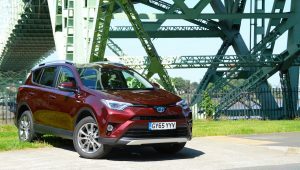 But the most disappointing thing is that since the original RAV4 was launched 22 years ago, this latest RAV4 doesn’t seem to have moved forwards in terms of innovation, but compared to today’s rivals, it seems to have gone backwards. Even the last RAV4 that we tested in 2010 looked more like a RAV4 SUV should look, and felt more capable. Our best hope is that the new Toyota C-HR, which looks better to our eyes than the RAV4 (although still slightly strange) will fare better when reviewed. Wouldn’t it be great if Toyota has managed to combine the outstanding driving dynamics of the GT86 with the efficiency of the Prius, in the futuristic body of the C-HR. We’re not holding our breath, but it will be interesting to find out. In the meantime, unfortunately the Toyota RAV4 Hybrid struggles to warrant any better than a Green Car Guide rating of 6 out of 10.